K Troop Mess Hall, where we never had so much as a single mouse. Well, we did have one mouse. He lived with L Troop but he ate his meals with us. Smart mouse. (Contributor's wanted) If you served in the US Army and have photos of army field cooking utensils, army cook books or anything related to the army's mess operations I would like to hear from you. Please send feedback. My interest in food began early with the family bakery. My grandfather operated Hersey's Bakery until 1946, when he died. I went to work in the bakery for my Uncle Bill when I was 12 years old and continued working on and off until 1965, the year that I graduated from high school. In addition to working in my uncle's bakery, I worked at Dunkin Donuts in Florida and I worked as a pastry chef at the famed Colony Hotel in Kennebunkport, Maine. 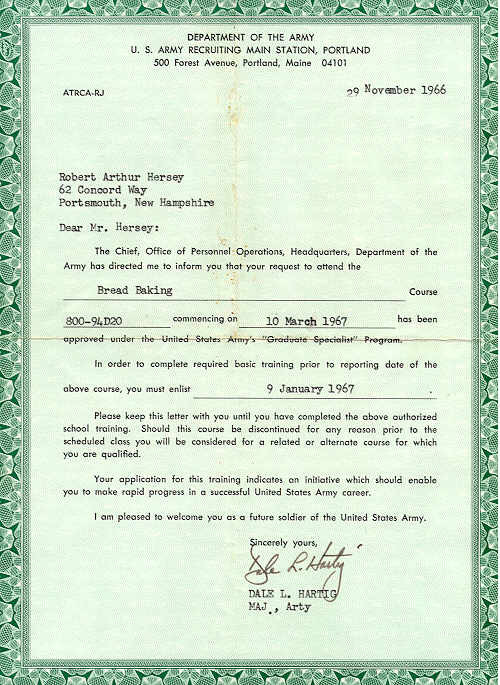 My Army career began with a promise. One of many that would not be kept. Above is the first. A written "Guarantee" that I would become a US Army Bread Baker. I attended the Quartermaster School's bread baking course at Ft. Lee, Virginia all right but that was the first and last time that I would bake bread in the Army. After graduation, I was sent to the 2nd Armored Cavalry Regiment in Germany. When I reported to the personnel officer he asked me what my MOS was. I told him, 94D20. He'd never heard of it. He asked me if I had ever driven a tank to which I replied, "every Saturday night to the drive-in back home." He wasn't impressed. He made me a cook. Thank God the mess Sargent utilized me as a baker. It wasn't until Vietnam that I would learn how to fry eggs, make coffee and burn toast. "In This Mess Hall Work The Finest Cooks In Vietnam". So Says The Sign Over The Door. When I arrived at Blackhorse, the Mess Hall was barely outfitted with cooking utensils. We brought our field ovens, ranges, pots and pans inside the mess hall to cook with. There was no water tower as seen in the picture above. We hauled water in from a nearby water trailer. The kitchen area had a dirt floor (which eventually was topped with cement). We had no steam tables to keep the food hot or cold storage except for a small refrigerator. By the time I left Blackhorse, all that I just mentioned was eventually installed. The mess section of K Troop was staffed with a Mess Sargent (an E-7 or E-8) a First Cook (an E-6) and four to six cooks depending on the current conditions. My rank was "Specialist 4 (E-4) when I arrived and I was assigned as a cook. I had no training as a cook (and no skills either). I learned everything from the Mess Sargent and the cooks. My favorite meal to prepare - breakfast. My best buddy in 'Nam was a fellow cook who was from Gardiner, Maine - Dave Mansir (third from the left). When at Blackhorse, we would sometimes consolidate the mess operations with a neighboring troop like I Troop or L Troop but most often, we would serve three meals a day in K Troop's Mess Hall. We would divide up our resources into two shifts. The Mess Sargent- Herbert Blackwell, would work each day and the First Cook would head up one shift and a First Cook designate would head up the other. Because I wasn't much of a cook and didn't really care for it that much, I would work a few hours each day and bake the deserts - pies, cakes, cookies, biscuits, rolls and the like. They were a big hit with the men. Country singer Mel Tillis was a baker in the Air Force. When asked if he served his country in the armed forces he replied, "Yes, I served cookies, cakes, pies . . . . ". When the troop was in the "Field", we would travel along with them with our Mess Truck in the dry season or we would set up a rear mess operation in what the Army called the "trains" during the rainy season. When we were in the field with the troop we would cook breakfast and dinner. Lunch would be an issue of "C" Rations. 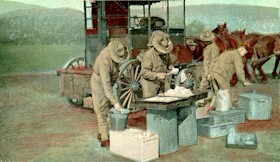 When the mess section was in the rear area, we would provide one or two cooks to the troop in the field. The field cooks would prepare a breakfast or scrambled eggs, bacon or sausage, pancakes, french toast, toast, juice and coffee. When the evening meal arrived by helicopter, the field cooks would unload the food that was cooked back in the rear area and serve it to the troops. We always got a large share of help from the men with us in the field. They would help us set up the food, serve it, clean up afterwards and help us bury the garbage. I had a great fondness for field duty in spite of the inherent risks of being exposed to the enemy's attacks. Field duty made the time pass more quickly and it gave me a greater sense of worth and accomplishment. When I was in the field I would ride "shotgun" with 4-0 track and later with the medic's track 7-1. I became great friends with many of the guys in the 2nd Platoon and would ride with them when the opportunity presented. Especially exciting were the night "ambush patrols". My Famous "GI Field Coffee"
To make my famous GI field coffee begin with 20 gallons of potable water from the water trailer. It's best when it's carried through a rice paddy knee deep full of water. Bring to a boil in a kettle over a standard issue field mess gasoline operated burner - preferably in the early morning darkness so as to give your position away to the enemy. If you survive the lighting of the stove then proceed to the next step. When the water boils, stir in two, 2-pound cans of ground coffee (it was probably Maxwell House coffee in an olive drab can). Depending on how strong the men like it you may adjust the amount upward or downward to suit their tastes. Once thoroughly stirred, lower the stove's setting until the water simmers. Cover and let simmer for about 5 minutes. Remove from the stove and add slowly one quart of cold water in a circular fashion starting in the center and working outward. This step takes the grounds to the bottom of the pot. Be careful not to disturb the brewed coffee but gently ladle from the top downward the coffee into another container. Preferable a coffee urn. Leave the little bit of coffee remaining in the bottom of the kettle behind. It contains the grounds. Believe it or not, this makes a delicious coffee. At least I thought so but of course, my taste buds were shot off in the war so you will have to judge for yourself. Serve with fresh baked buns or ladyfingers. My Not So Famous "S-O-S"
"Shucks-On-A-Shingle" - you translate. Every GI since Hannibal crossed the Alps has eaten or at least encountered SOS. It is best described as a plate of mouse droppings in wallpaper paste served over burnt toast. It's actually quite good (but remember I lost my taste buds in the war). Start with 10 pounds of ground beef (hamburger). The fatty kind is best. Brown the beef in a large saucepan with salt, pepper, finely chopped onions and a splash or two of Worcestershire sauce. This next ingredient isn't in any of the Army's cookbooks but I always added a generous portion of cooking sherry. If I didn't have sherry I would add cognac. Once browned, add a cup of water, a cup of whole milk and bring to a boil. Slowly stir in 1/2 cup of bread flour. This thickens the mixture. Lower the heat and cook slowly for about 5 minutes. If the sauce is too thick add more milk. If it's too thin add more flour. Hint: It's best if the final product is a little on the "thin" side because as it sits in your mermite can, it will thicken up. Serve over toast or better yet, hot biscuits. Any leftovers may be used as brick mortar by the engineers.